This article is for 4★ , Altria Pendragon (Santa Alter). For 4★ , see Altria Pendragon (Alter) or 4★ , see Altria Pendragon (Lancer Alter) or 5★ , see Altria Pendragon (Rider Alter). The original 5★ Altria Pendragon can be seen here. Awarded to players for completing the Almost Weekly Santa Alter Event. Greatly restore one ally's HP. Deal very heavy damage to all enemies. Overcharge: Slightly charges your NP gauge. Increase Star Generation of all allies by 20% while she's on the field. 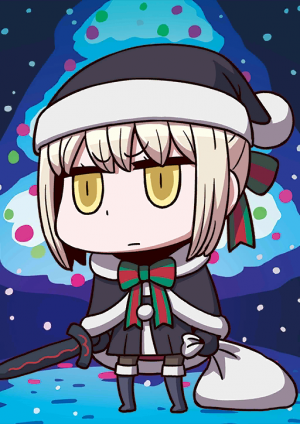 In order to erase her own bad image, Altria Alter decided to become Santa Claus, a friend to all the children in the world. The bag she carries includes presents she carefully selected throughout the entire year. Her attempt to become a Santa Claus has resulted in many changes to her personality. Although she's become a Rider, there are no other dramatic changes. Her increase in weight is due to all the presents. Her cold personality and actions are similar to the original Alter, but her deep love for Santa Claus has made her a little more kind. 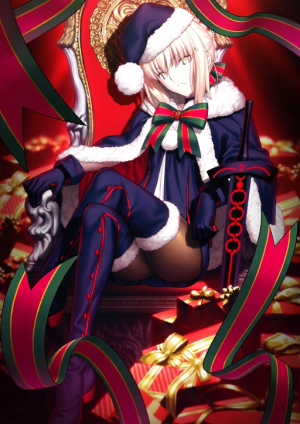 Santa Alter made her sleigh herself. She proudly proclaims that it's modeled after powerful lions and horses, and made from ash wood. But no matter how you look at it, it looks just like a hippo. Its name is Llamrei Unit II. A sword that shines with a dark aura. Also, because its name doesn't change, it's different than a certain Servant from Halloween. 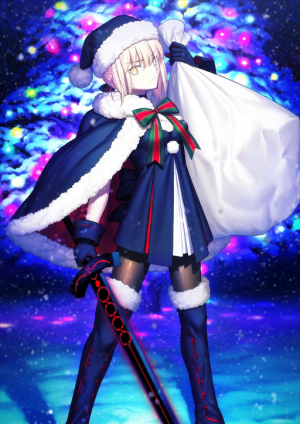 This sword is completely unnecessary for someone like Santa Claus, but since there will be monsters during Christmas by some sort of mistake, it's good to keep around. A skill she gained by becoming Santa Claus. She brightens hearts by giving presents, but since every present is slightly different than what the recipient wanted, it doesn't work as well as you might think. She has an almost genius-level talent at picking presents that bring out past trauma in others. I could really go for some turkey, you know. 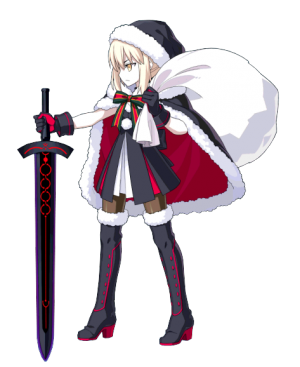 A form taken by Altria Pendragon (Alter), who resolved herself to wiping out her own image and attempted to carry out activities as Santa Claus, the ally of children. The sack she holds in her hand is packed with the best selection of presents that she spent a whole year saving up. Because she has completely turned into Santa Claus, her personality has changed in various ways. Although she has changed into the Rider class, there have not been any dramatic changes. The increase in weight accounts for the weight of the presents. The lack of futility in her behavior and the cool-headed character are a close resemblance to Alter, but the admiration towards Santa Claus that lies at her root is making her a little more kind. The sleigh that Santa Alter rides was handmade by herself. She boasts that it was assembled from ash tree wood using a horse and lion for imagery, but - no matter how you look at it - it seems like it cannot be anything else but a hippopotamus. It's name is Llamrei II. The sword of black aurora. Just as it is. The fact it has no twists in the name makes you feel the difference between the Servant that made an appearance in Halloween. An article that is entirely unnecessary for Santa Claus, but since monsters might come out during Christmas by some sort mistake, she won't lose anything by holding onto it. A skill acquired by completely turning into Santa Claus. Enriches hearts by giving presents. However, because said presents' designs are subtly different from what the targeted person requested, you cannot expect much from its effects. One could say she has a natural gift for making choices that subtly invoke trauma in others. "At any rate, I feel like eating turkey." 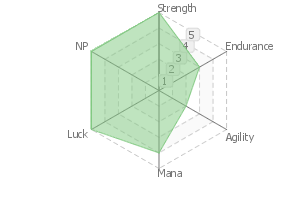 She shares the exact HP values (at both minimum and maximum) with Anne Bonny & Mary Read.